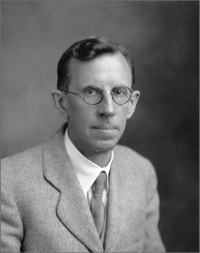 Clinton Joseph Davisson was a Professor of Physics at the University of Virginia (1947-1958). Other institutional affiliations include Bell Laboratories and Western Electric Company. He was awarded the Nobel Prize in Physics in 1937 with George Paget Thomson. October 21, 1881Birth, Bloomington (Ill.). 1908Obtained BS, University of Chicago, Chicago (Ill.). 1911Obtained PhD in Physics, Princeton University, Princeton (N.J.). 1911 – 1917Assistant Professor of Physics, Carnegie Institute of Technology, Pittsburgh (Pa.). 1917 – 1925Researcher, Engineering Department, Western Electric Company, New York (N.Y.). 1925 – 1946Member, Technical Staff, Bell Telephone Laboratories, Murray Hill (N.J.). 1929Member, National Academy of Sciences. 1937Awarded Nobel Prize in Physics with George Paget Thomson "for their experimental discovery of the diffraction of electrons by crystals". 1947 – 1958Professor of Physics, University of Virginia, Charlottesville (Va.). February 1, 1958Death, Charlottesville (Va.). Worked together on the Davisson-Germer experiment, which confirmed the de Broglie hypothesis. Shared the 1937 Nobel Prize in Physics "for their experimental discovery of the diffraction of electrons by crystals." Advisor at University of Cambridge. Both employed at Bell Telephone Laboratories. Both employed at University of Virginia. Both employed at Western Electric Company and Bell Telephone Laboratories. Both employed at Carnegie Institute of Technology. Clinton J. Davisson correspondence, 1913-1957. Clinton J. Davisson letters to Louis de Broglie, Hans Albrecht Bethe, and Philip McCord Morse, 1927-1936. Clinton Joseph Davisson papers, 1916-1957 (bulk 1917-1946). Letter to Elizabeth Wood about experiments on quartz, 1955. Oral history interview Addison Hughson White, 1976 September 30. Oral history interview with Alan Holden, 1974 July 30 and 1976 June 21. Oral history interview with Dean E. Wooldridge, 1976 August 21. Oral history interview with Foster Cary Nix, 1975 June 27. Oral history interview with Gerald Leondus Pearson, 1976 August 23 and 8 April 1980. Oral history interview with Hans Bethe, 1981 April 29. Oral history interview with Karl K. Darrow, 1964 April 2 and 10 June. Oral history interview with Katharine Milsted Kelly, 1976 July 2. Oral history interview with Raymond W. Sears, 1975 July 14. Oral history interview with Walter M. Elsasser, 1962 May 29. Oral history interview with William Shockley, 1974 September 10. Elizabeth A. Wood letters, invitations and a photo, sent to Wood concerning Max von Laue, Paul Peter Ewald, C. J. Davisson, and Karl K. Darrow, 1951-1977. Interview with Lester H. Germer [motion picture] / produced by Bell Telephone Laboratories. Karl Darrow correspondence relating to history of physics, 1943-1968. Lillian Hoddeson addition to papers, 1913-2006. O. W. Richardson papers, 1897-1959 (bulk 1920-1940). "Clinton Joseph Davisson:1881-1958", Biographical Memoirs of the National Academy of Sciences. C.J. Davisson, L.H. Germer, and the discovery of electron diffraction. Clinton J. Davisson Physics Today obituary.